Duluth’s West End had a large Swedish population during the 1890s and the early years of the twentieth century as immigrants from Sweden came for jobs with railroads, sawmills, flour mills and metal manufacturing plants. The West End was conveniently located for those occupations. By 1898 four Swedish churches stood within a few blocks of each other: Swedish Evangelical Lutheran Bethany, First Swedish Baptist, Swedish Methodist, and the Swedish Church of Christ. Episcopalian Swedes worshiped at St. Luke’s Episcopal Church at 19th Avenue West and Third Street, organized in 1888, which only offered service in English. Those who spoke Swedish wanted services in their native language. So in 1899 the Episcopal Diocese of Minnesota sent Rev. Knute S. Tottermann from Faribault to Duluth to establish a mission church for West End Swedish Episcopalians. 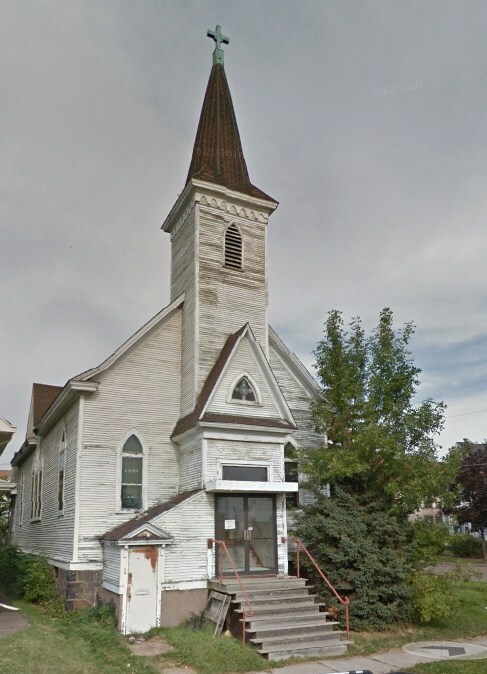 It was named St. Peter’s Swedish Episcopal Church and during its first few years held Swedish-language services at St. Luke’s or in a vacant store on Michigan Street. Duluth pharmacist Lewis Rietz, who was born in Sweden and attended college there, also studied theology. In 1902 he was ordained by Duluth’s Episcopal Bishop J. D. Morrison and became the Episcopal rector at St. Peter’s. Tottermann left for Europe. Although St. Peter’s had a small congregation—it organized with only 21 members—it was able to raise $1,350 to purchase a lot on the corner of 28th Avenue West and First Street. In 1903 they built a small, clapboard-sided church. It featured a square tower with steeple over the front entrance and Gothic-style windows, but had no basement. A stove served as its only heat source. The tiny congregation offered a Sunday school, guilds, a Men’s Welfare League, a women’s auxiliary, and put on bazaars. By 1909 the congregation realized it needed more space. It had grown in numbers, and the congregation at St. Luke’s Episcopal, after losing their rector, wanted to join St. Peter’s. In September, 1910, work began on remodeling and enlarging St Peter’s. The building was raised and added a basement, complete with a heating plant. The expansion included Sunday school rooms, a choir room, and worship space for 300 people. A rededication of the enlarged St Peter’s Swedish Episcopal Church took place in February, 1911. The Duluth News Tribune reported that, “The interior has been beautifully redecorated, making it one of the handsomest in this end of the city.” To accommodate both parishes, services were held in Swedish on Sunday morning and in English on Sunday evening. By 1917 the church had dropped “Swedish” from its name and was referred to as St. Peter’s Episcopal Church, but it still held services in both Swedish and English. It continued to serve the West End until 1935, the last year St. Peter’s occupied the building. In 1938 the building became the home of the Christian and Missionary Alliance Church, an international organization which sends missionaries to foreign fields and has headquarters in Colorado. The group remained there until 1965 when the congregation built the church it still occupies at 2621 West Arrowhead Road. From 1968 to 1991, several fundamentalist congregations worshiped in the church at the original St. Peter’s. From 1992 to 2003 the building, no longer a church, was home to Accordion Concertina Music, a business for instruction, sales, and repair of accordions. As of 2014 it appears to be a residence.